Happy new year! I hope that you’re excited about 2016! But what exactly should you expect this year from your cat? Well, perhaps this guide could be useful. This post covers the first three signs of the zodiac—Aries, Taurus, and Gemini. Each section features a cat from the One-of-a-Kind Cat Book, along with a general forecast. 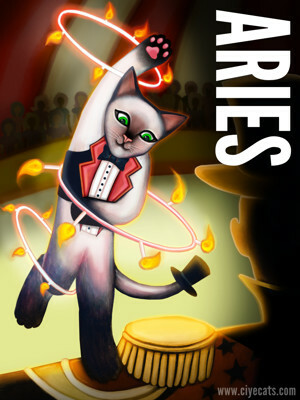 Thea the cat is one half of the Firetwin Circus. Together with her human friend Ayden, she has entertained audiences all around the world. She is famous for twirling flaming hoops. Lots of them. Need I mention that she’s not afraid of danger? 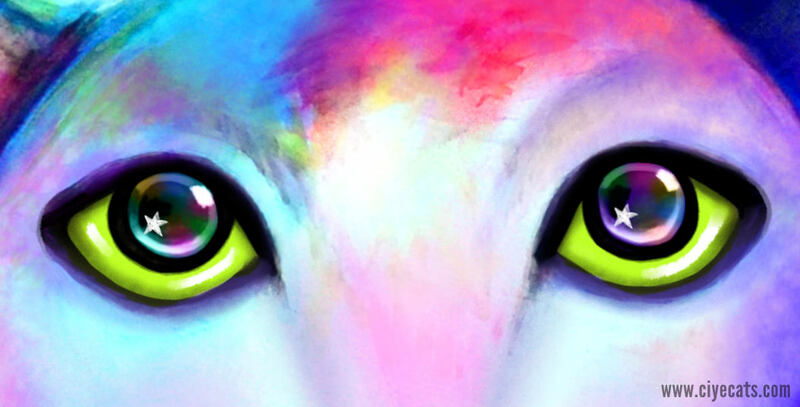 2016 will be an intense year for your Aries cat. You’ve probably gotten used to your fiery kitty’s active personality—but beware, you haven’t seen nothing yet! This year marks a new chapter in your cat’s adventures, and nothing will frustrate him or her more than a boring home. Stock up on new toys, organize kitty play dates, and plan some fun trips. Just remember to use a cat-leash when you go camping. Wanderlust could lead your Aries cat far into the bushes! Abhisar is a white cat who lives in India. He is the companion of a young American backpacker named Chelsea. Together, he and Chelsea have been exploring the holy city of Varanasi. Taurus is an earth sign, and such folks love to keep their paws firmly on the ground. Abhisar is no exception. He like to wander the countryside and hates to be rushed. This easy-going cat appreciates beauty and wonder; some of his favorite things include the Holi festival, the temples of Varanasi, and the local frangipanis. Abhisar is a loyal and reliable guide. He radiates comfort and stability, and his companionship is a wonderful gift. You may have noticed that your Taurus cat was in a bit of a slump in 2015—lots of lethargic moments, listless moping, and overnapping (even for a cat). Thankfully, this year is a shot in the arm for your Taurus cat. And the name of this shot? Love. 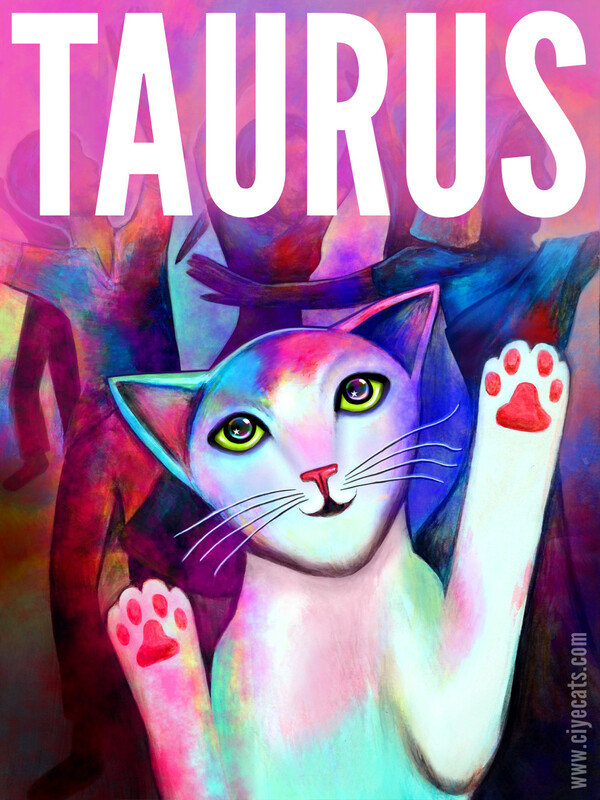 In 2016, Love is all around the Taurus cat. New friends, humans, and perhaps even (friendly) dogs will enter your cat’s life. And all of these experiences will bring out the Taurus cat’s affectionate nature. 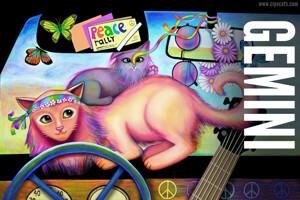 The year is 1969, and a movement of peace is sweeping across North America. 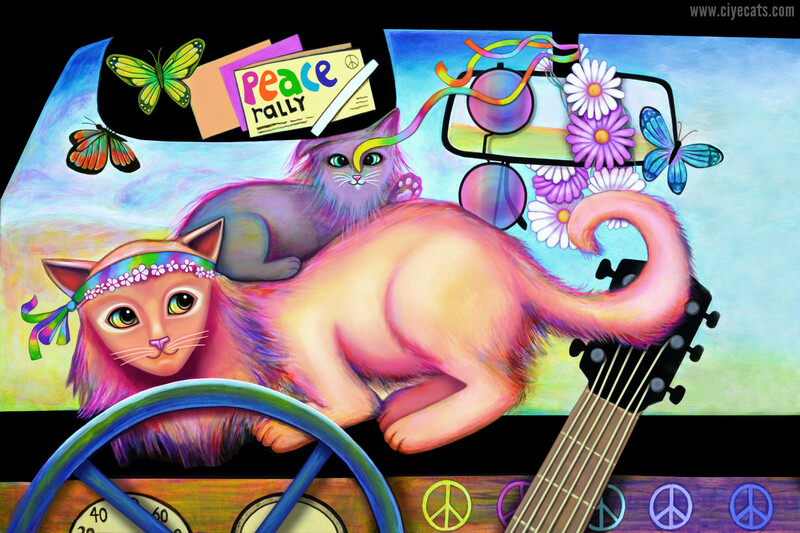 Halston and Ralston are two fun-loving hippy cats. Their human is a traveling musician named Owen. Halston and Ralston are following him on a journey towards Woodstock. Halston and Ralston are brothers from the same litter. One might be smaller than the other, but they both share the same Gemini energy. These twins are sprightly, multi-faceted, and ready for anything. They are endlessly chatty, and it’s not uncommon to find them meowing away into the wee hours—much to Owen’s frustration. They have a strange ability to communicate with humans. Even though they only use meows, purrs, and caterwauls, somehow they always manage to ‘get their point across.’ Like all Geminis, they can start a conversation with practically anyone. New sights, sounds, and ideas are a source of delight to these cats. They looooove improvising, which is why they enjoy free-styling with Owen. 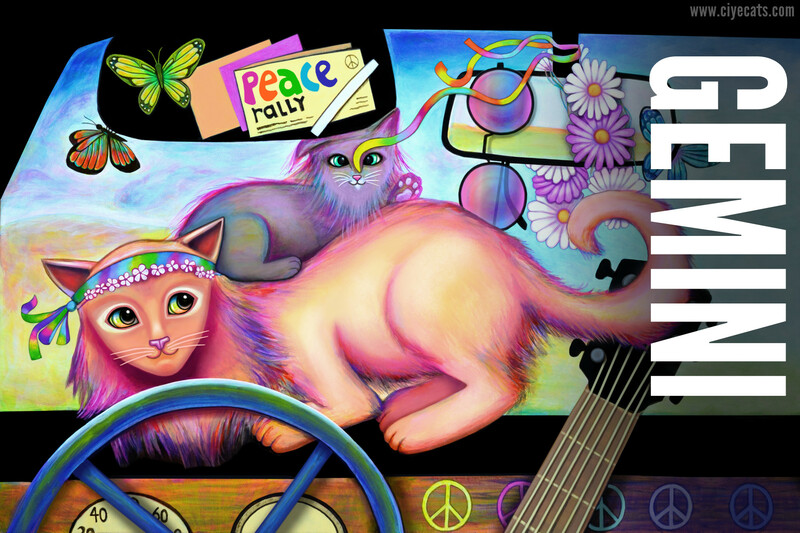 2016 will be a busy year for your Gemini cat. But that’s okay. By now you should be used to your cat’s whirlwind presence. He or she is always up to something or ready to push over something (a nice vase, perhaps? ), and this year is no exception. There could also be a new addition to your family, so a shelter visit could yield a new sibling for your Gemini cat. But don’t worry. Everyone should adjust in no time. STAY TUNED for Part 2 (Cancer, Leo, Libra). And let me know your thoughts on kitty astrology! Time for another OOAK Cat spotlight! Today I wanted to do one on the Hippy cats from the book. The year is 1969, and a movement of love and liberation is sweeping across the USA. Eastern philosophy, tie-dye clothing, and peace messages are everywhere. New ideas are springing up like neon-colored daisies. But anyway, back then, hippy culture seemed so… “I dunno… ancient!” Yet, now that I’m an adult, there’s something about that movement that fascinates me. Perhaps it’s the psychedelic colors. Perhaps it’s the reckless abandon. Maybe it’s the way that folks romanticize hippies and their notions of love and freedom. I like to fly by the seat of my pants, so I don’t usually spend too much time planning. I like to do a few doodles in a notepad, then draw right onto my board and see what happens next. The upside of this is the fact that great ideas can emerge out of nowhere; the downside is that I often end up repainting the same board multiple times. Originally I wanted to have a lava lamp on the dashboard, but it wound up looking stupid. Nonetheless, I’ve included a snapshot of what the lamp was like. I had the orange cat positioned behind the glass, which explains why his right eye is ginormous. 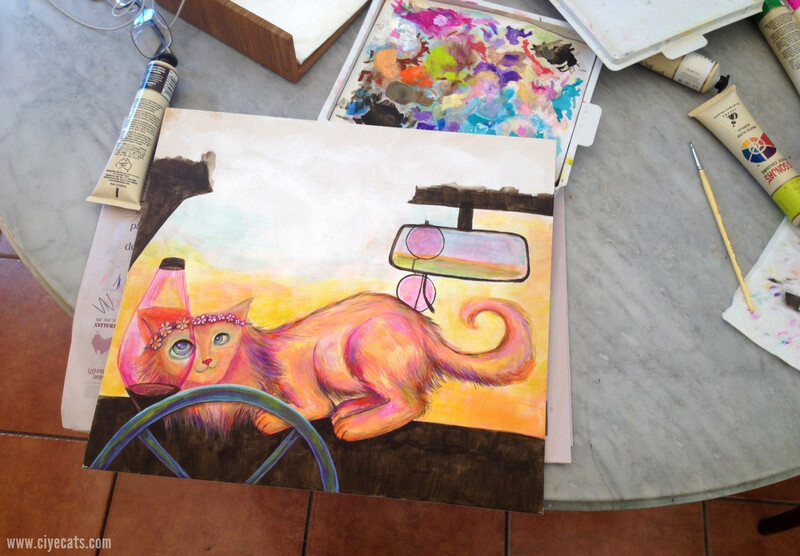 I went on to repaint the cat and added lots of headbands. 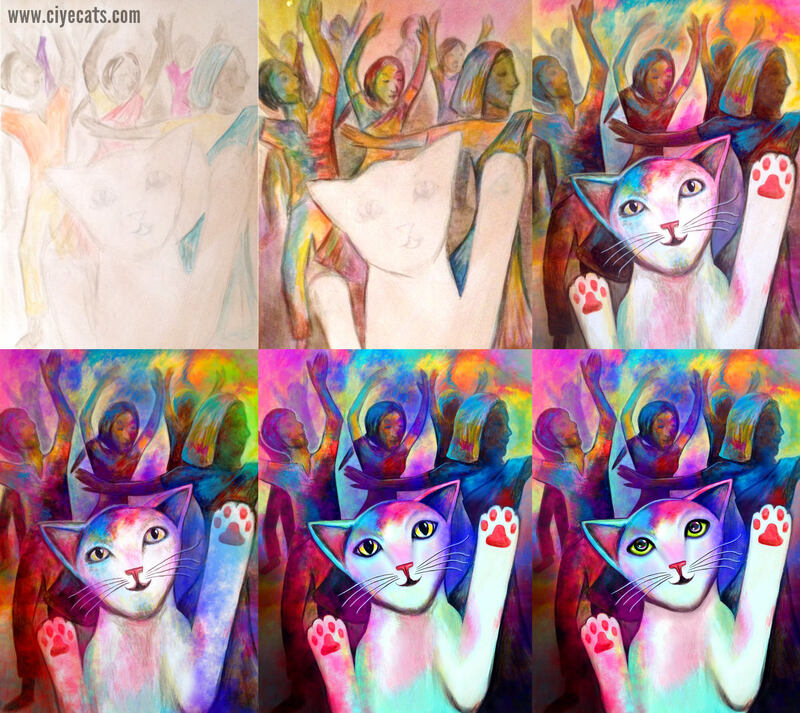 The two cats are full of green, blue, purple, and red strokes. I like to infuse solid colors with rainbow flecks, for I feel that this adds dimension and character. In this case, rainbow shades tie in to the whole psychedelic theme. As with all my other work, I photographed my draft and added/corrected/rearranged details in a photo-editing program. I hope you enjoyed reading this. If there’s anyone else who’s ever felt like a dinosaur, let me know in the comments. Abhisar is a white cat with yellow-green eyes. He lives in India and is the companion of a young backpacker named Chelsea. Together, Abhisar and Chelsea go sightseeing around India. The image of Abhisar shows him celebrating Holi, the famous color festival of love. I’ve always been fascinated by pictures of the Holi festival. All that colored powder must be a sight to behold in real life. In all the pictures I’ve seen, the colors swirl and mire into psychedelic clouds. Okay… so maybe I’m being a bit melodramatic. I won’t die if my skin touches fabric softener. And of course, cats don’t usually give me allergy problems (well, at least not the short-haired ones). Go figure. Still, going to Holi would probably knock me out! Here’s a link to a Youtube video of some guy GoPro-ing at Holi. I gave Abhisar a plain coat so he could be a ‘blank canvas’ for the powder. Like most of my work, this illustration began as a physical painting. I used Jo Sonja artist acrylics on a piece of MDF (Medium Density Fiberboard). 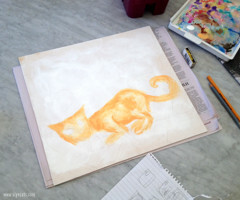 The resulting work is what I consider to be a painted draft. Concept artwork, if you will. I photographed this draft and loaded it onto my MacBook. Next, I used a photo editor to paint new elements and change others. If you look at my progress shots, you’ll notice a great difference between my acrylic painting (number 3 in the montage) and the final work (number 6). Most of my computer work consists of adding dimension, evening out tones, and making colors pop. I used computer-generated clouds to make the Holi powder seem more realistic. I added little stars and rainbows to Abhisar’s eyes. I googled a bunch of Indian names, and from what I understand, ‘Abhisar’ means ‘companion.’ I could be wrong though, for I also found an article that said Abhisar means ‘heading towards.’ Either way, they both seem appropriate for a worldly feline. Perhaps someone who speaks Hindi could help me out? The way that people spend their money says a lot about their passions. Some folks spend hundreds of dollars on comic books. Others spend thousands of bucks on rare dolls. There are people who spend money planting trees to save the environment. But me? If I were lucky enough to win the lottery, I would buy some land in the Blue Mountains and build a ranch for unwanted cats. A place for shelter cats that no one wants to adopt—blind cats, special cats, missing-a-few-limbs-here-and-there cats. Oh, and cats who are so old that they probably remember where they were sitting when they heard about Princess Diana’s death. In the ViewMaster of my imagination, I can see a complex with walls made of scratching posts. All around this building would be fields of cardboard boxes. And of course, beyond this would be beautiful trees and verdant pasture. In short, it would kind of be like Tippi Hedren’s pet sanctuary, the Shambala Preserve. Except just for cats. So I guess you could call it Kittybala. I would have an enormous staff of humans: retired firemen who would spend their days pulling cats out of trees; delivery boys would deliver fresh (empty) boxes; and volunteers who would man a snow machine filled with catnip. But why am I telling you all this? Well, I wanted to express my love of cats. I love all sorts of cats. The cute ones, the affectionate ones, the mean ones, the socially-awkward ones… I think they’re all miraculous beings. And this is why I decided to create an illustrated cat book. The One-of-a-Kind Cat Book has 127 pages and 50+ paintings. Waiting within its pages are 33 unique cats that I wish were real: Catalina the narcissistic movie star, Kit the steampunk genius, Guillaume the macaron chef, Ozzie the Flying Ocelot, Dolly the Harajuku cat, and many, many more. To learn more, please have a look around www.ciyecats.com. There’s a trailer, a gallery, and some additional info. The book is currently only available on my website. It’s an eBook that you can buy for $3. 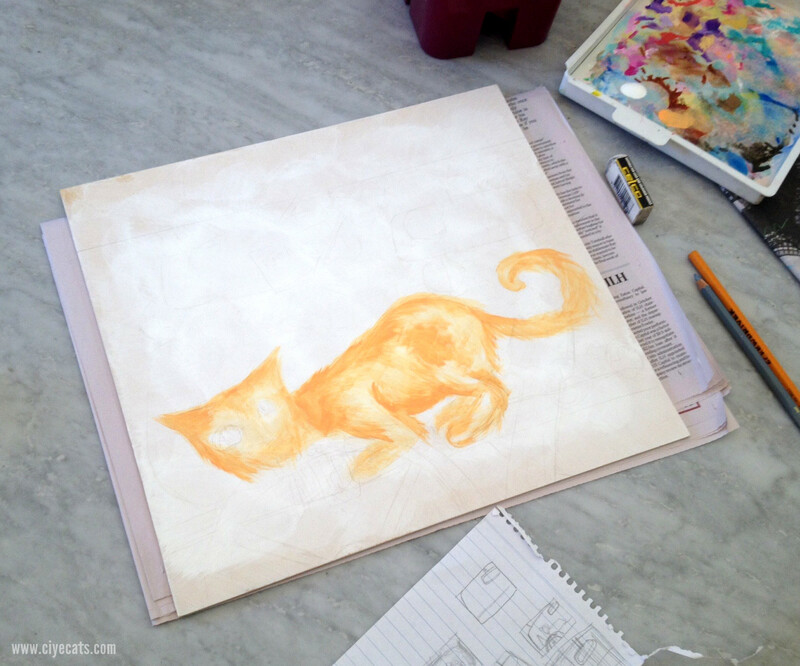 A physical version of the OOAK Cat Book is something I plan to produce somewhere down the line. As I mentioned in an earlier post, I’m thinking of doing a kickstarter to get the funds for a hard copy. But in order to do a successful crowdfunding campaign, I’ll need to get this book off the ground. So I hope you’ll take a chance on OOAK Cats. If you like what you see, please follow my blog and social media profiles. Some goodies and surprises are going to emerge in the near future. P.S. : If you won the lottery, what would you do with your cash? Let me know in the comments section. 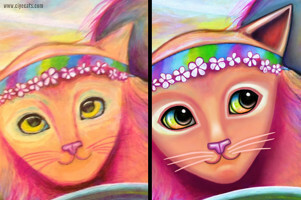 My name is Ciye Cho, and I’m the author of several YA books and an illustrated cat book. You can learn more about my past work at www.ciyecho.com. However, this blog will mainly be used to keep my readers updated on the One-of-a-Kind Cat Book and everything feline-related. 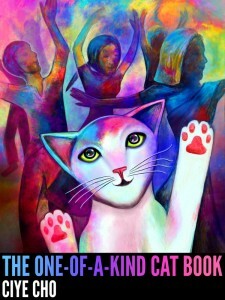 The OOAK Cat Book is currently only available as an eBook through www.ciyecats.com, but it is my intention to one day setup a kickstarter and produce a souped-up physical copy. You know, a proper shiny, sparkly, awesome booky-book version. But in order to make that happen, I’ll need to get this eBook off the ground. So hey… check out my book (it’s only 3 buck right now! ), follow my social media profiles, and keep tabs on my blog. I highly recommend joining my newsletter and subscribing to my blog.